Although energy and sports drinks have different purposes, they have one thing in common: they often contain added citric and other acids to improve taste and prolong shelf life. Their high acid content can harm tooth enamel. Although enamel is the strongest substance in the body, acid can dissolve its mineral content. And although saliva neutralizes acid after eating or drinking and helps restore lost minerals to the enamel, it may not be able to keep up if the mouth remains acidic for a prolonged period of time. That could happen with both beverage types. While energy drinks have higher acid levels than sports drinks, both are high compared with other beverages. A recent laboratory experiment studied the two beverages’ effect on tooth enamel. The researchers submerged samples of enamel in six different beverage brands (three from each category) for fifteen minutes, and then in artificial saliva for two hours to simulate mouth conditions. They repeated this cycle four times a day for five days. At the end of the experiment the enamel in the energy drinks lost on average 3.1 % of their structure, while the sports drink samples lost 1.5%. Although energy drinks appeared more destructive, the acid in both beverages caused enamel damage. Although there are other factors to consider in real life, the experiment results do raise concerns about both beverages’ effect on dental health. 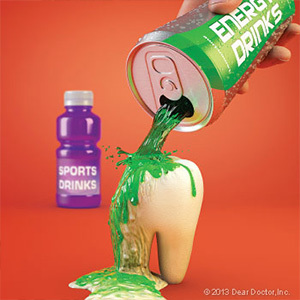 You can, however, minimize the potential harm to your enamel from energy or sports drinks. First, try other beverage choices lower in acid; water, for example, is a natural hydrator and neutral in pH. Try to only drink energy or sports beverages at mealtimes when your saliva is most active. And after drinking, rinse your mouth out with water to dilute any remaining acid. And although it sounds counterintuitive, wait about an hour to brush your teeth after drinking one of these beverages. Your enamel can be in a softened state before saliva can re-mineralize it, so brushing earlier could remove tiny amounts of enamel minerals. Taking these steps with energy or sports beverages could help you reduce the chances for enamel erosion. Doing so may help you avoid unnecessary damage to your teeth and overall dental health.